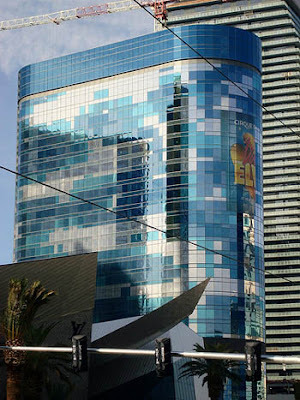 News broke today that MGM Resorts International has submitted a plan to Clark County to demolish the Harmon hotel tower by implosion. People have been speculating for almost a year now that the stalled CityCenter hotel would be demolished, but this is the most definitive statement yet that MGM has made regarding the project. It was previously thought the Harmon would sit untouched until the legal battle between MGM and Perini was over, but it looks like MGM wants to move right away with the implosion. It could happen as early as six months from now. It's sad to see a brand new building be imploded, but this has to be done by MGM. One of the major flaws of CityCenter is the main resort - Aria (and the casino) is so far away from the Strip. While they can't move Aria, imploding Harmon will allow them to construct a grand entrance-way to CityCenter, hopefully with moving walkways leading to Aria. This wasn't entirely unexpected, but it appears MGM will have to jump over a few hurdles before they are able to demolish the Harmon. Clark County has asked for more detailed plans regarding the implosion, including details on how the Harmon would affect hotel room supply and demand in Las Vegas. There are also safety concerns because the Harmon is located so close to Las Vegas Boulevard and surrounding hotels. The Strip would probably have to be shut down for the implosion. Perhaps the biggest obstacle for MGM is the pending litigation between them and the builder, Perini Building Co. Perini still maintains that the flaws in the Harmon aren't that serious and could be fixed. Check out this Vegas Inc article for more about the Harmon implosion obstacles.